A woolly mammoth skeleton is seen on display at the Venetian Resort Hotel Casino in Las Vegas in September 2009. 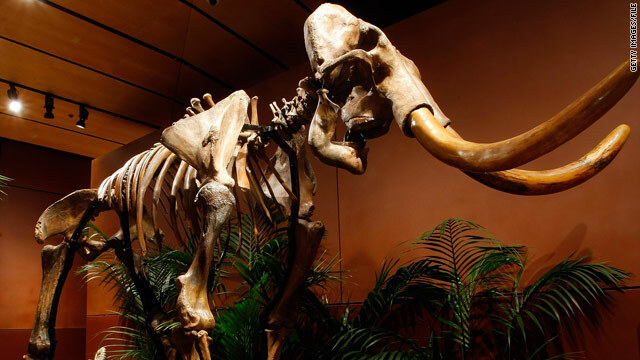 A team of scientists from Japan, Russia and the United States hopes to clone a mammoth, a symbol of Earth’s ice age that ended 12,000 years ago, according to a report in Japan’s Yomiuri Shimbun. The researchers say they hope to produce a baby mammoth within six years. The scientists say they will extract DNA from a mammoth carcass that has been preserved in a Russian laboratory and insert it into the egg cells of an African elephant in hopes of producing a mammoth embryo. The team is being led by Akira Iritani, a professor emeritus at Kyoto University in Japan. He has built upon research from Teruhiko Wakayama of Kobe's Riken Center for Developmental Biology, who successfully cloned a mouse from cells that had been frozen for 16 years, to devise a technique to extract egg nuclei without damaging them, according to the Yomiuri report. The U.S. researchers are in vitro fertilization experts. They, along with Kinki University professor Minoru Miyashita, will be responsible for implanting the mammoth embryo into an African elephant, the report said. Filed under: Animals • Japan • Russia • U.S. This is frigging horrible. Not to even speak of the poor "mother" elephant, but such an offspring would live its entire life being poked, prodded, studied, sampled, tested, weighed, photographed and eventually cut up to be studied. This isn't beneficial science, it's kids poking bugs with sticks. I'm real sure that if these scientist have the ability to re-create the dead they should have the cure for cancer. Oh but wait I believe they do, they are just keeping it an underground secret because there would be a great employment loss along with the amount of money there receive for cancer research. Keep the prehistoric where it belongs and help cure those who fight for their lives every day!!! Worst idea ever because it will die of loneliness being the only of its kind. This is exactly what happened to an elephant that was brought to St. Lucia. As long as they don't clone my eighth grade music teacher. God, she was awful ! Good, I hope they clone it, breed it, and reintroduce it to the wild. Humans were probably the major factor in why it went extinct, so it would be appropriate if we helped to bring it back. You're probably right. The ice age creature went extinct like the majority of all other ice age creatures, not because of its loss of environment, but because of man. Oh wait...i see what you're saying, excuse me haha. The mammoth went extinct because man's global warming caused it to lose its natural environment, well that makes a lot more sense! They went excting because of Bush ask any democrat. I think this would be a fantastic breakthrough in science. It would be the event of the century. I would love to see a mammoth if not a herd of them. I would like to see more of the extinct animals be brought back and reintroduced into a natural environment. So much is lost when something goes extinct. If our harmful human interference with the environment does not stop there will be many more creatures going extinct. Like the tiger for one. FANTASTIC ABOUT TIME WE MADE SOME PROGRESS IN THIS CLONING BUSINESS ONCE DONE WE CAN MOVE ON TO THE MOST IMPORTANT TASK AT HAND AND CLONE CINDY CRAWFORD,AND CLAUDIA SCHIFFER. is it nuclear cloning? then what about mitocondrial cloning? infact the mammoth will be hybrid. This is great, I wonder why CNN removed it from the news page? I hope to see more science storys in the future.